While branded items often seem like the more favourable option, when it comes to the basics, sometimes own brand is best. I'm always stocking up on my firm favourites from the aisles of Boots so I've narrowed down a few of my most loved, worth a mention. It's always handy to have a stash of the Boots Cotton Buds around. Sneezing while putting on mascara occurs pretty much on a daily basis for me so I find these really handy to have around to correct my makeup. I also find them great for nail polish removal to tidy up around the edges of your nails. PS, the ones from the baby section are often cheaper! 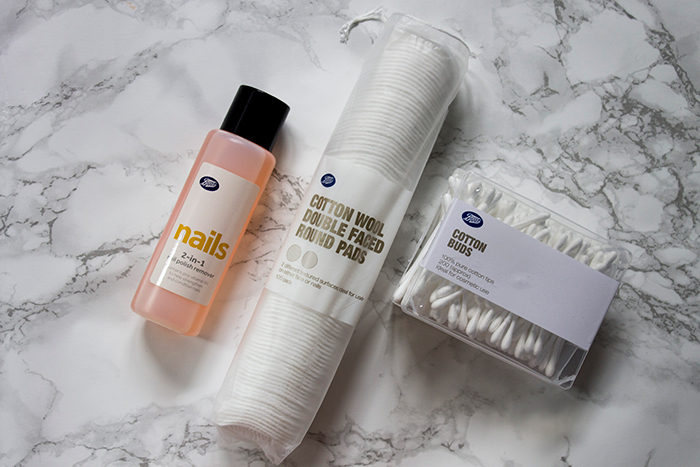 I prefer to remove my eye makeup seperately so I use the Boots Cotton Wool Double Faced Round Pads to do the job. These are great because they're suitable for many uses from nail polish removal to cleansing your skin due to the double sided nature of the pads. You can get larger versions but I find these to be the perfect size, I often split them in half to use on each eye instead of two separate pads which makes them last much longer. Speaking of nail polish removal, nothing compares to the Boots 2-in-1 Nail Polish Remover. This one not only removes polish effectively but also helps to strengthen and condition the nails at the same time. Plus it smells 10x better than every other nail polish remover I've tried. It just goes to show you don't need to spend a fortune on good quality essentials! Do you have any beauty essentials?